Casinos in several parts of the world have faced dwindling client numbers since many countries or states have instigated smoking bans. Atlantic City’s now closed Revel casino that cost 2.4 billion dollars to build opened as a completely non-smoking casino but this policy was quickly revised. Most casinos now have designated smoking areas but casinos still look for ways around the ban and come up with some ingenious ideas. The Hilton Hotel on Park Lane in London has plans to open an outdoor casino on part of its roof to allow players to smoke as they gamble. 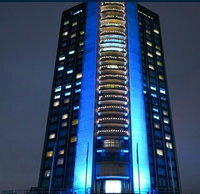 The Hilton Hotel in the upmarket area of Park Lane in Central London opened its casino in November of last year. The private casino has a 1000 pound annual membership fee. The casino is a popular London venue for many high rollers who spend fortunes there. Several of these players come from countries where there is no smoking ban in public places in force. In order to make their clients feel more at ease while they gamble the Hilton Hotel casino is to construct an open air casino. The proposal is to place casino gaming tables on part of a terrace extension on the second floor of the hotel. The rooftop extension is believed to cost several million pounds. The casinos’ clients will be able to play roulette, blackjack, baccarat and three card poker at tables placed on the open terrace. Westminster Council has banned the outdoor casino from having either live or recorded music in the open air section so that the hotel’s neighbours aren’t disturbed. Another Central London casino, Les Ambassadeurs also has an open air gambling area so that its clients can smoke while they gamble. The Hilton Hotel’s private casino members will be able to smoke as they play from April of this year when the new extension is due to open. London casinos aren’t the only ones looking for ways around the smoking ban. The Nevada based casino tycoon, owner of Las Vegas Sands, Sheldon Adelson pulled out of a major investment plan in Spain to build a gambling complex known as Euro Vegas. One of his several reasons for this was the Spanish authorities refusal to overturn the smoking ban in place in the country for clients in EuroVegas casinos. Casinos in Macau have also imposed a smoking ban and this isn’t helping to fill casinos that are reeling from a steady decline in numbers of clients mainly from China where a corruption crackdown is keeping players away. In the United States the beleaguered Caesars Entertainment group is doing its best to find a solution to a possible drop in revenue in its casino if the authorities in New Orleans bring in a proposed smoking ban in April 2015.